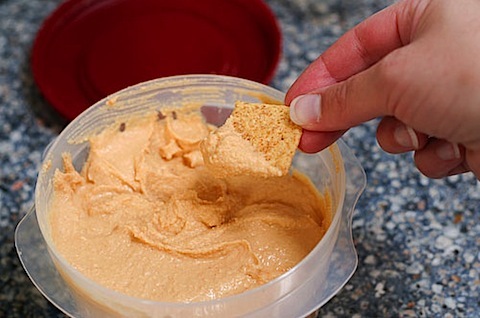 One of our favorite after work snacks is hummus and crackers. (I’m partial to Wheat Thins.) Or, whip some some homemade pita bread, for a true treat! After eating store bought hummus for years, it amazing how different and tastier homemade hummus is. One downside to homemade hummus, however, is that it doesn’t last as long as the store bought kinds. You pretty much have to eat it within a day or two. It’s so tasty though, it shouldn’t be a problem! Homemade hummus is pretty easy to make, requiring just a few ingredients. You can also experiement with different flavors. In addition to regular hummus, we’ve made smoked paprika hummus and kalamata olive hummus. Next on the list might be a roasted red pepper hummus. Combine lemon juice and water in small bowl or measuring cup. Whisk together tahini and 2 tablespoons oil in a separate small bowl or measuring cup. Process remaining chickpeas, garlic, salt, cumin, and cayenne in food processor until almost fully ground, about 15 seconds. Scrape down bowl with rubber spatula. With machine running, add lemon juice-water mixture in steady stream through feed tube. Scrape down bowl and continue to process for 1 minute. 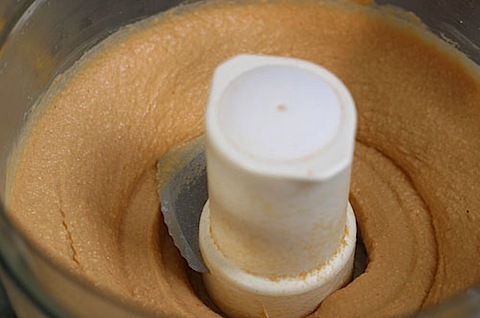 With machine running, add oil-tahini mixture in steady stream through feed tube; continue to process until hummus is smooth and creamy, about 15 seconds, scraping down bowl as needed. 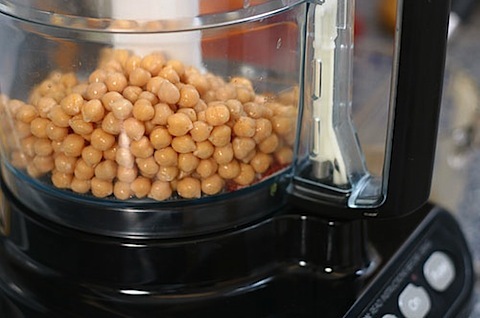 Transfer hummus to serving bowl, sprinkle reserved chickpeas and cilantro over surface, cover with plastic wrap, and let stand until flavors meld, at least 30 minutes. Drizzle with olive oil and serve. Oh I love hummus and this looks like the perfect recipe for it – thanks!